The creation of the National Training Center for Biosafety and Biosecurity (NTCBB) under the National Institutes of Health was approved by the UP Board of Regents on February 22, 2018. The NTCBB becomes the 11th component institute of the NIH, along with three centers and more than 40 study groups. With the approval of the Center, the BOR also approved the creation of the National Biosafety Framework that covers aspects of both biosafety and biosecurity. During the 1st Consultative Conference on the Establishment of the Biosafety and Biosecurity Framework and Launching of the NTCBB, Director Raul Destura presented the mandate, goals and flagship programs of the Center. To promote a culture of safety and security in all laboratories working on biological hazards in the Philippines and the region. 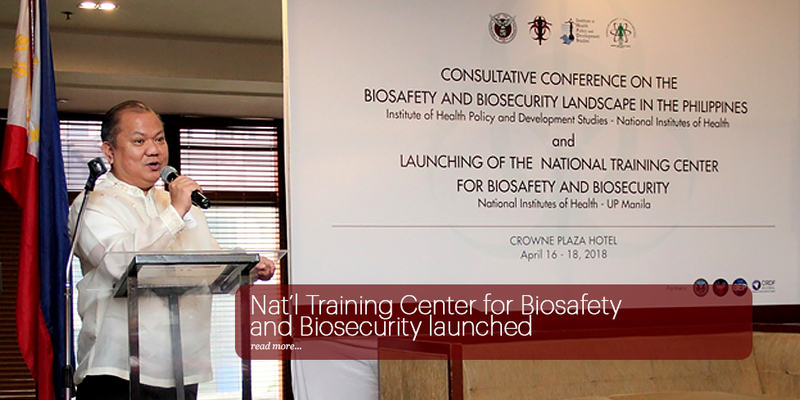 Specifically, it is envisioned that the Center will be a source of relevant information and expertise related to the practice of biosafety and biosecurity in the Philippines, provide the capacity for training for biosafety and biosecurity practitioners in the Philippines, and be the focal training center in the country that will link with counterpart organization globally. The Advanced Biorisk Officers Training (ABOT) and Certification Program is one of the NTCBB’s flagship programs. This has generated over 80 certified biorisk officers from key institutions, such as the Research Institute for Tropical Medicine and San Lazaro Hospital both under the Department of Health; UP Diliman, UP Manila, regional government hospitals, private hospitals, and universities from Luzon, Visayas and Mindanao. “All 80 graduates of the ABOT program are now leaders in their respective institutions. The ABOT was designed for graduates to create their own awareness programs and I am proud that they have been fulfilling this task,” Dr. Destura stated. The program is now on its 5th certification to be initiated in mid 2018. It is considered one of the most successful programs funded by the US State Department-Biosecurity Engagement Program that is being modelled now in other parts of Asia, according to Dr. Destura. Other flagship programs of the NTCBB are Curriculum Integration and eLearning Programs, Short skill-set training, Biological Safety Cabinet Evaluation and Certification Program, and Mock-labs Training Facility. Dr. Destura revealed that there over 800 biological safety cabinets in the country that are up for evaluation.